Nestled in beautiful Northern Highland State Forest in Boulder Junction, Wisconsin, White Birch Village Resort offers an unforgettable stay for the whole family. Otherwise known as the ‘Musky Capital of the World,’ Boulder Junction is set within a chain of lakes that offers a wealth of outdoor activities and adventures for outdoor enthusiasts. 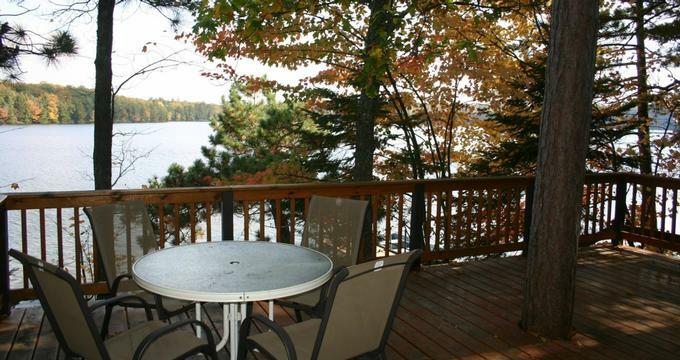 Surrounded by 60 acres of beautifully manicured gardens and grounds in a beautiful lake setting, White Birch Village Resort features a selection of comfortable accommodations, ranging from guest rooms and suites in the main lodge to vacation rental homes for large families and extended stays. White Birch Village Resort features a selection of comfortable accommodations, ranging from guest rooms and suites in the main lodge to vacation rental homes for large families and extended stays. Rooms and suites in the lodge are themed two-story units that can sleep up to six people and feature fully equipped kitchenettes with microwaves, toasters, coffee makers and small refrigerators, and spacious living rooms with comfortable seating and queen-size beds dressed in luxury linens and hypoallergenic pillows. The second floor of the units have two double beds dressed in luxury linens and hypoallergenic pillows, and a half bath with a shower and toiletries, and units open onto private decks with charcoal Weber grills and beautiful lake views. The White Birch Village Resort also offers well-maintained vacation homes, which feature fully equipped kitchens with all the appliances, dishes and utensils needed for self-catering, living rooms with plush sofas and armchairs and wood burning fireplaces, bedrooms with king or queen-size pillow-top beds dressed in luxury linens and hypoallergenic pillows, and en-suite or shared bathrooms with walk-in showers, soaking tubs, or combinations of both, fresh towels, bathrobes, and organic bath products. Vacation homes have decks with patio furniture, and a charcoal Weber grills and guests have access to a 14’ Alumnacraft row boat and motor. Three of the homes have air-conditioning, and ceiling fans and all have modern amenities, including LCD televisions with cable channels, mini-fridges, microwaves, coffeemakers, hairdryers, irons and ironing boards, telephones with voicemail services, and complimentary wireless Internet. Guest staying in the lodge rooms enjoy a complimentary breakfast every morning and includes coffee, tea and hot beverages, fresh fruit and juices, cereals, granolas and yogurts, egg dishes, and freshly baked pastries, and bread. Vacation homes have fully equipped kitchens with appliances, including fridges, microwaves, coffeemakers, and utensils needed for self-catering purposes. Amenities and facilities at the Birch Village Resort include basketball courts, a sandy beach, campfire pits, canoes, kayaks, and paddleboats, a diving raft, a fish cleaning house with a freezer, a fireside room with a satellite TV, a games room with foosball, pinball, darts, ping-pong, electronic games and a jukebox, and a library with a computer. Other facilities include a guest laundry, a picnic with a screened pavilion and barbecue grill, a children’s playground, a sand volleyball court and shuffleboard courts, geocaching, a nature trail with bird-watching stations, and an exclusive spa with whirlpool baths. There is a splash pond, tetherball, two horseshoe courts, and snowshoes in winter, while guest services include a weekly Tuesday night potluck picnic during the summer months, weekly picnics, free morning coffee, and complimentary wireless Internet around the property. Summer activities in and around the resort include a sandy beach and a diving raft, a children’s playground, campfire pits, paddle boating, canoeing, kayaking and tetherball, basketball, shuffleboard, and sand volleyball, horseshoes, disc golf, and indoor games. There is a hot tub and weekly Tuesday night potluck picnics during the summer, as well as a nature trail and miles of local hiking, birding, and bike trails. Winter activities include snowshoeing, ice fishing, snowmobiling, cross-country skiing, downhill skiing, an Ice Out Contest in March, and games, puzzles, and DVDs in the library.